Double-potting begins with a deep container, say, an “azalea” pot or standard-size one, 6-8 inches in diameter. Crock this as usual, and then fill in with soil about 1/3 of the way up. At this level place 4 hyacinth bulbs. 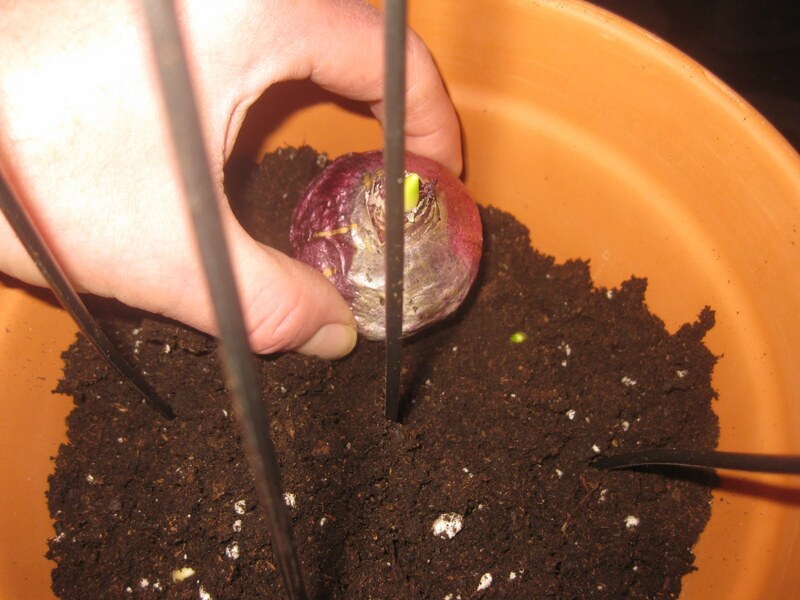 Between each bulb, insert bamboo sticks which are tall enough to rise above the rim of the pot. Cover the bulbs with soil. 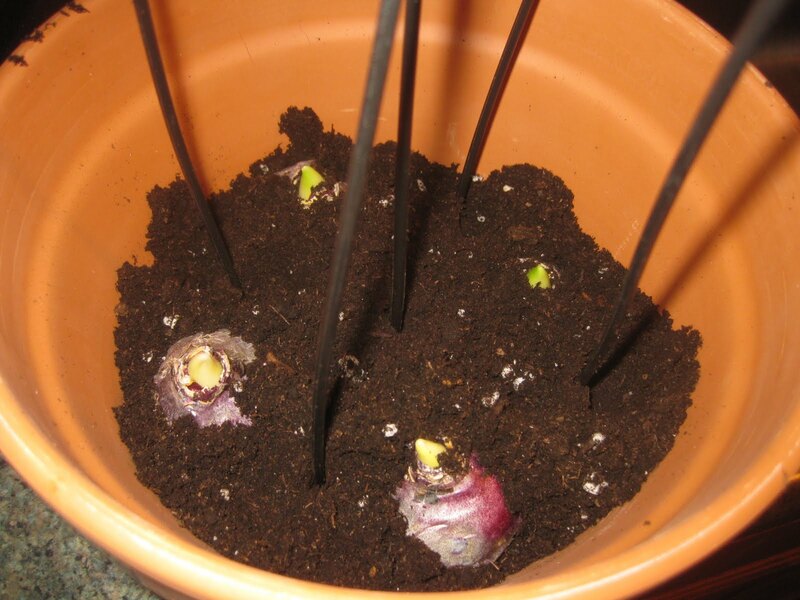 Next, plant more hyacinths (I managed 5 for the upper level), using the stakes as guides to avoid setting the bulbs over the tips of those below. Finish off by covering the “upstairs” bulbs with soil. As always, make sure to leave a one inch opening between the soil surface and the pot rim for the receipt of water. Now bang the pot against the floor a few times to help settle the soil. Then set the pot in a dishpan or sink of water, until the soil becomes quite wet. Finally, label the pot. Then set it some place dark and cold. Because my spare refrigerator is already filled with potted bulbs and also hyacinths in bulb vases (all these arranged back in October), my latest project is destined for the bulk-head of my cellar. There through winter the space stays between 35-45 degrees. 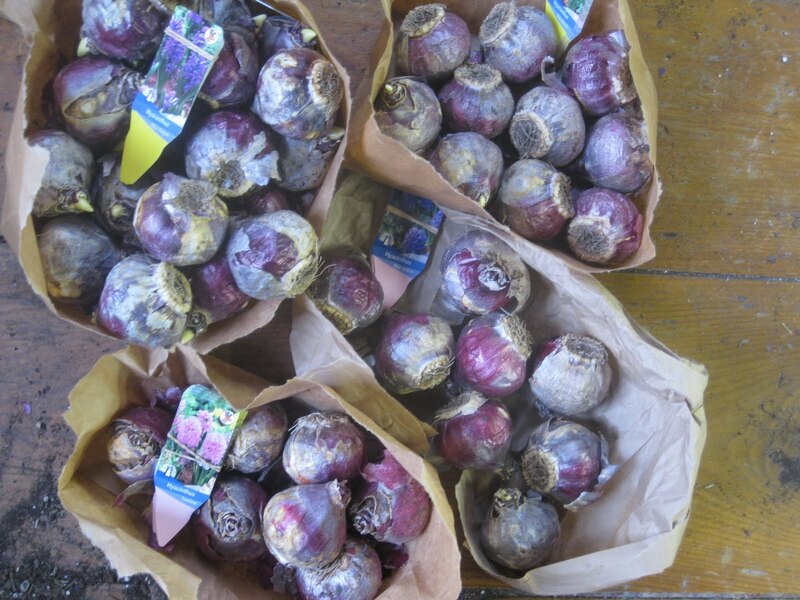 Like most other Dutch bulbs, hyacinths require 12 weeks of cold storage. 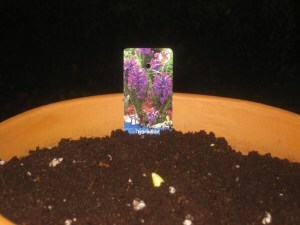 Hyacinths planted in two tiers will root and grow successfully around each other. True, the lower bulbs will take a little longer to reach the surface — they have more distance to travel — but once above ground they should catch up to the top level of bulbs, and open their fragrant buds at the same time. I look forward to showing you pictures of these in bloom. 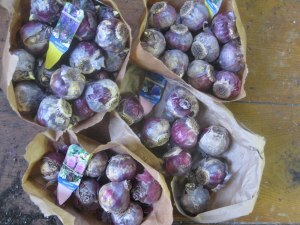 And here’s a thought: If you want a real bargain on hardy bulbs, go shopping for them now, in December. Unless your garden center is run by idiots (and some are), any remaining inventory of bulbs should be deeply discounted. That your spare fridge is already filled with potted bulbs brings me great delight. How lovely. And how helpful this post is to all of us who are eager to do as you do. Plant on! Marion Roach Smith — ah, the lengths we indoor horticulturists go through in order to achieve flowers at the wrong time of the year! Kevin, how lucky you are to receive all those bulbs! Great idea to double pot them. I hope you'll show pictures when they are in bloom. By the way, I do remember Thalassa Cruso. What a hoot she was. There is no one on TV today who can match her prickly charm! So for these hyacinths that you pot up now, would you still bring them out of cold storage around 10 weeks or could it be sooner? Ken – Unfortunately, there's no wiggle-room with Dutch hyacinths. Regardless of when they are potted (and my current crop was potted very late), they still require about 12 weeks of cold storage in order for their embryo buds to develop. This requirement is in their genes. Otherwise they will send up only leaves, not flowers, when brought to the window garden. Yet another great idea from your site!!! I suppose this would work freesia corms? I had a windfall of clearance freesia from Home Depot this last week! PS My freesia in water is already forming roots! Zehra – Yes, freesia could be double-potted. That is, if you don't mind all the messy foliage the corms put out before the flowers emerge! bulbs, & don't want to lose these. Many thanks for your advice. Dear Anonymous – I think you also posted to this urgent question under “Ask Kevin” — and I've left you a happy answer there. 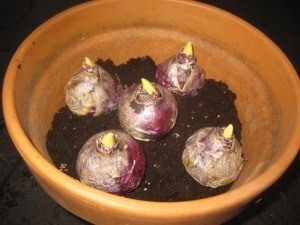 In short, your bulbs will be fine if you pot them now, and continue to chill them. In mid-March bring them to full sunshine. At this time provide food with every watering. The bulbs will bloom in April. When the flowers fade, transfer the plants to the open garden. In 2 years time they will surely bloom again. This technique is wonderful, can you use it for tulips? I’m a new reader to your blog and am gobbling it all up! Thank you! Hi Austin – Yes. Tulip bulbs can be double-potted, too!